Wednesday, Mar. 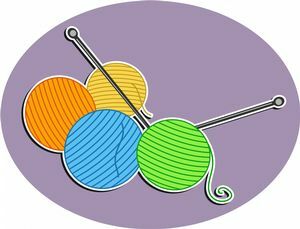 27, 2:00 p.m. to 3:30 p.m.
Every Wednesday from 2:00 - 3:30 p.m. the Margaret K. Troke Branch Library presents "Troke Knitters." Knitting provides many benefits, such as new friendships and benefits for health issues such as pain, depression and stress relief. Our presenter, Martha E. Zetter, Holistic RN, CRM, Ret., has been knitting "since I was 5 years of age; … not a day goes by in which I do not knit. The benefits I have experienced from this craft are too numerous to mention." In our community, there are many needs for knitted goods such as for chemotherapy patients, preemie hats, and hats and scarves for children and adults. The community also needs lap robes and shawls for chemotherapy and dialysis patients, who become very cold during treatment. There are needs for Twiddle mitts for dementia/Alzheimer patients and for mats for our four-legged creatures in shelters. Participants may keep their products for their own use or donate them to one of these charitable causes. For beginners who wish to learn knitting, Ms. Zetter will offer informal instruction. If participants want to gather for the camaraderie and knit for themselves, they are also welcome and will be recipients of her assistance as needed. All ages and genders from 8 to 100 (or more!) are welcome. Continue the learning by checking out books, reviewing online databases, and searching the Internet – all for free at your local public library! they gifted 720 single handknitted/crocheted items into our local community. That's amazing, from 12-15 knitters meeting weekly! This years recipients of their gifts were: Golden Haven, Helping Hands, TLC school, St. Joseph Hospital Ped. Dept., Dignity Alcove and Shriners Hospital. Creativity blossoms forth in hats, scarves, lapghans, comfort dolls, shawls and twiddle muffs. As they begin their 5th year they welcome newcomers of all level of expertise. For those wishing to learn the art, Martha Zetter, facilitator/instructor, is happy to teach. Any and all donations of yarn are most welcome. Contact Martha, 209 478 7630 to arrange for pickup.